Pieces of my favorite paintings in the Ringling Museum, Sarasota. Detail from a Rubens Tapestry design. Detail from a Rubens Tapestry design showing manna falling from Heaven. Detail from Domenico Puligo's 'The Virgin and Child in Majesty with Saints Quentin and Placidus,' 1521-22. Painting attributed to Nicolas Bollery title 'The Actors' from around 1600. This guy meant business. 6 faces and 6 hands in one painting with a linear composition. Detail from 'Portrait of a Woman' attributed to one of Rembrandt's apprentices. Detail of seaweed strewn on shore from Carl Marr's 'Mystery of Life,' 1879. Detail of dead woman's legs from Carl Marr's 'Mystery of Life,' 1879. Detail from Ash Can Painter Robert Henri's 'Salome,' 1909. The Biltmore Estate doesn't have the greatest art collection and I suspect they know it. Excepting Zorn's painting "The Waltz" you can nary find a postcard or print of the paintings there. Not only can you not buy reproductions of the works, you can't really see them while you're inside the house itself. The rooms are extremely dark, making it very difficult to get a proper look. I would suggest that some of these works are perhaps not so prominently displayed because they are not great examples from the artists, but whether it's a great Sargent or not, it's better than I could do and I want to be able to see it. Above are the two John Singer Sargent paintings on display at the Biltmore. Were there a little more light, you could almost get a good look at the one of Frederick Law Olmstead from the roped off area. These two huge portraits were commissioned by George Vanderbilt for the house. To me, the quality of the paintings in comparison with other Sargents suggests to me that he wasn't all that excited about them. It would be difficult to tell a Vanderbilt that you don't want to take their commission because it bores you. 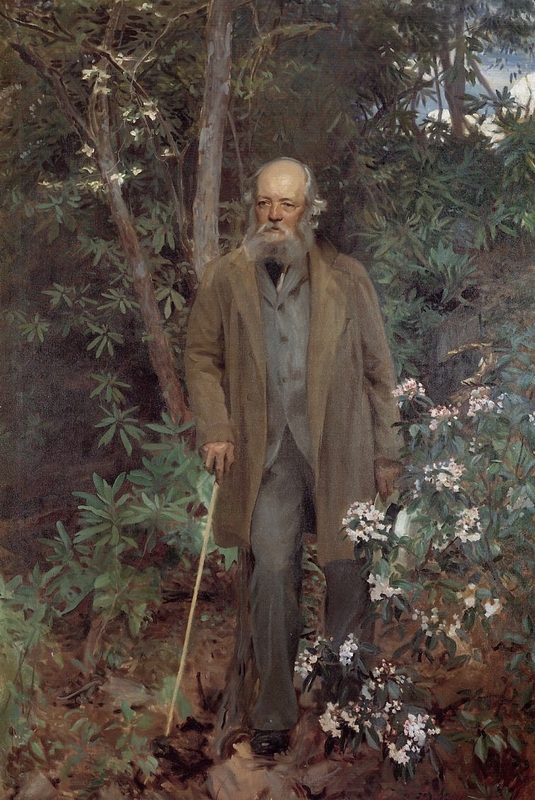 The painting of Landscape guru Olmstead, of Central Park fame, seems contrived. At the museum they tell you that this was painted out of doors, but if that was the case, how could Sargent miss the dappled light that would have appeared on the clothing where it had filtered through gaps in the canopy? The face and body have been smoothed over so that the figure looks almost blurry. The landscape portion is well painted. My favorite part is the little corner of sky in the upper left hand. It is hint of life and light in a dreary feeling painting. The portrait of architect Richard Morris Hunt was less successful. The painting of Hunt looked almost unfinished. The overcoat puffed over his shoulder looks awkward and it seems that the paint is so thin you can see some underpainting through the fabric. Not what I would expect in a light area of the painting. For non-painters out there, you usually paint thicker with lighter colors. "The Waltz" by Anders Zorn, purchased by Vanderbilt in 1893 at the World's Fair Columbian Exposition in Chicago. I liked this one, but once again it was hung high and in the dark. 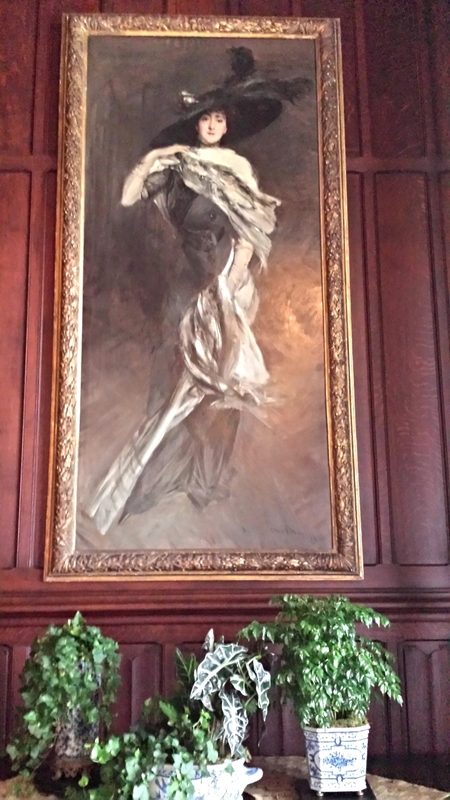 This portrait of the lady of the house, Edith, was painted by Giovanni Boldini. Today Boldini is lesser known than Sargent, but in his day he was a preeminent society painter, known for his swishy style. Her feet hung above my head, so this was the best picture I could get of her. I wasn't particularly excited about this portrait either. The face was well done, but it was just a little bit boring and Boldinis aren't supposed to be boring. After visiting, I would say that unless you can get some sort of special pass to get behind the velvet rope (with a ladder and a spotlight) don't plan on the Biltmore Estate as an art pilgrimage. There are some very nice paintings there but their presentation is so poor that you can't even see them. While in DC this year for the Portrait Society of America's annual conference I was able to visit the National Portrait Gallery. Not just me, they bussed around two-hundred portrait artists to the gallery. It was surreal to walk the gallery and hear well known contemporary artists such as Quang Ho, David Kassan, Burt Silverman, and Ann Manry Kenyon comment on the works of Thayer, Sargeant, and Cassatt. This sizeable painting of H.H. Richardson by Hubert von Herkomer was completed in 1886. It was a favorite with the artists because the girthy fellow has big presence. Trained in Paris at the Ecole des Beaus-Arts, Henry Hobson Richardson became America's leading architect in the late 1880's. He designed a wide range of structures, including churches, railroad stations, department stores, courthouses, libraries, and private homes. 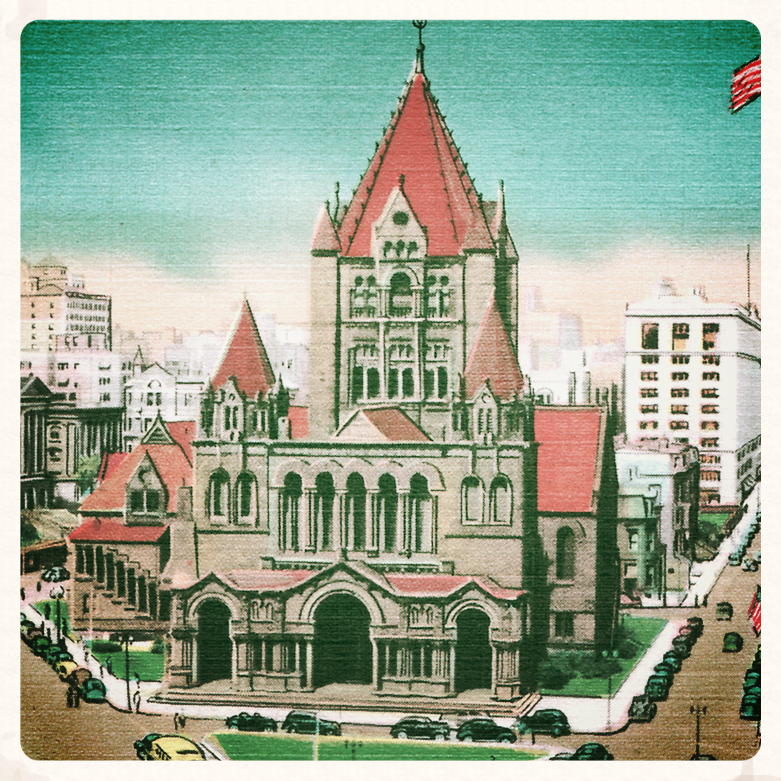 Best known today for Trinity Church in Boston, Richardson fused the Romanesque style of medieval France with the picturesque style popular in England and the US. In this portrait, British artist Hubert von Herkomer found his sitter's girth, accentuated by the rounded pitcher in the background, and ideal metaphor for his character. During the sittings, Herkomer noted that Richardson was "as solid in his friendship as in his figure. Big-bodied, big-hearted, large-minded, full-brained, loving as he is pugnacious." This is Richardson's neighbor at the Gallery, inventor Isaac Singer of sewing machine fame, 1869. Singer's machine could sew 900 stitches per minute, more than twenty times as many as a skilled seamstress. The details and variety of brushstrokes in this work are astounding. Singer commissioned this portrait while living in Paris, after scandals about his private life forced him to relocate to Europe. American artist Edward Harrison May painted him in clothing that reflects his wealth and trademark extravagance. Detail from Cafe at Biskra, Algeria by Frederick Arthur Bridgman. This painting is like two paintings. There's the main scene shown above, but then corridor in the background, shown left, serves as a secondary focal point. Both are beautifully painted, but I almost prefer the background. And now for two of my favorites from the hall of musicians. "Bravo!" showcases the composers and performers who brought the performing arts to life from the beginning of the 20th century to the present. Love this one of Benny Goodman. To me it looks like he sounds. The fellow to the right played in his band for quite a while so they sort of go together. This enormous portrait of Lionel Hampton by Frederick J. Brown is 96 & 1/8" tall. That's over 8 feet! Lionel Hampton began his musical career as a drummer until Louis Armstrong encouraged him to take up the vibraphone in the early 1930s. Hampton introduced that instrument to the jazz idiom. Hampton's high-energy spontaneity was legendary: "We got no routine," he once said. "We just act the way the spirit moves us." I'll have to save the Thayer's for another post.